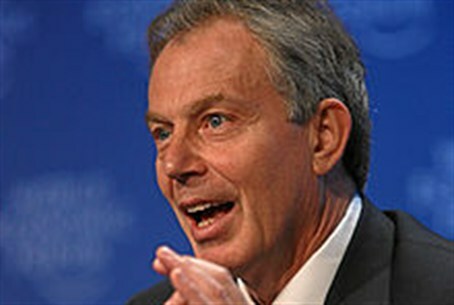 Tony Blair may be ending his exile from British politics and assume at 57 the role of elder statesman. Don't look now, but Tony Blair may be on the verge of a political comeback. It won't be in the form of contesting the leadership of the Labor Party but rather in terms of influencing the party that he led to three successive electoral triumphs. Five years ago, Blair left office under the cloud of the unpopular war in Iraq and the accusation that he had effectively functioned as George W. Bush's poodle. In the meantime the political wilderness was not all that onerous. Blair played Middle East representative for the Quartet but basically grew increasingly affluent as a popular lecturer and a globetrotting consultant. Now it appears that he is ready to come in from the cold. French Socialist presidential aspirant Francois Hollande visited London to dispel apprehensions that a Socialist president would take a punitive approach to the business world and adopt a financially irresponsible course for his country. Hollande compared himself to Barack Obama and to Tony Blair. He praised Blair for rebuilding the British health and education systems after they had been run into the ground under conservative governments. More importantly, he had combined progressivism with electability and instead of sticking to hackneyed left right divisions he emphasized what worked in practice. His only criticism of Blair was that he had as underestimated the importance of regulation. Hollande while displaying a commanding lead over Nicolas Sarkozy in the polls needs to shore up international support. Sarkozy has German Chancellor Angela Merkel effectively campaigning for him, and he is about to meet British Prime Minister David Cameron for a summit. Hollande believes that linking up with Blair, who in 2007 all but endorsed Sarkozy, helps him electorally. More important than visiting Socialists are the meetings that Blair is having with freshmen Labor MPs who solicit his advice. That advice was vintage New Labor, namely that the party could not afford to be seen as anti-business and had to compete for the political center. Another straw in the wind was the article penned in the New Statesman by one of Blair's ardent supporters in Labor, former Foreign Minister David Miliband. Miliband in his article warned the party against nostalgia for an increasingly powerful state which took on too many responsibilities and then faced the crisis of how to fund them adequately. He also asked his fellow party members to take note of the fact that the left was out of power in 24 out of 27 European countries and draw the conclusions. "We have to be reformers of the state and not just its defenders." Miliband criticized his party and by implication his party's current leader Ed Miliband for squandering Tony Blair's success in winning the confidence of business first when Blair was elected leader of the opposition in 1994 and subsequently from 1997 as Prime Minister. "It was a tough job to win back economic trust after 1992. The bequest from 2010 is even tougher. At the last election, not a single major business endorsed Labour, and we cannot afford that again." Miliband and Blair are on the same page and they both may be ready to jump in again.